Catching fish on a surface fly is a hoot. A trout or bass that rises to a fly drifting on top stays in your mind long after the fight is finished. But as you practice and perfect fly-fishing skills, you learn most fish are not caught on the surface. In fact, most are taken close to the bottom. The problem this presents for the fly angler is that fishing tight along a stream bed can be a hassle. 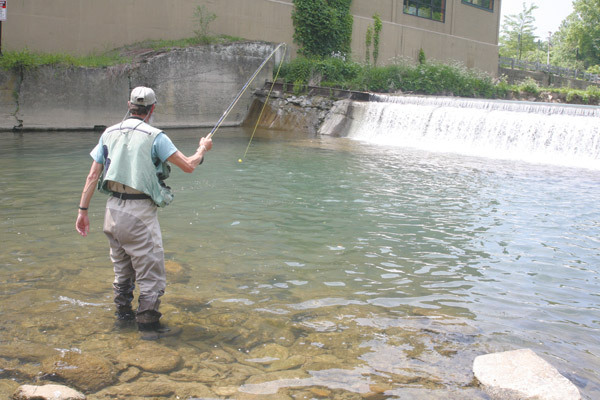 Sure, a streamer or nymph may ride just above the rocks and marl for a few feet, but the trick is to keep it down in the strike zone for a considerable distance. The longer the fly is in the strike zone ... well, the rest of the statement is obvious. Last year, I watched a fly fisherman work some churning water on Trout Run Creek in southeast Minnesota. To protect the creek from cattle-caused and natural erosion, volunteers had built buttressed banks and in the stream itself a series of steps and plunge pools. The pools extended 7 to 12 feet downstream from each step and varied in depth from 2 to 4 feet. Normally, that is not deep enough to hamper just about any method of fishing a fly deep, and there are several methods. But the swiftness of the current kept this anglerÕs fly up and out of the strike zone. He dipped the fly at the start of the plunge pool, yet it didnÕt make contact with bottom until it was practically in the shallow riffle at the end. Not wanting to be a pest, I waitedÑdozing beneath a shade treeÑuntil he stepped out of the water. When he did, I asked what he was using, and he showed me an unweighted nymph that he said often caught fish in these pools. The fly was beautifully tied. However, the angler had failed to take into consideration what the lack of weight was allowing the fly to do in that current. Switching to a weighted nymph or streamer is the simplest and often first way to get a fly deep. In thin water, or where there is only light current, tying on a fly weighted with wraps of lead, lead substitute, or a metallic bead may be all you need do. It certainly has its pluses, because thereÕs no other paraphernalia on the line, and the angler usually feels the strike fast and sure. At the very least, this angler should have been using a weighted fly, and in a plunge pool or in pocket water, itÕs often necessary to move to the second technique to get and keep a fly deep. After the angler handed me a few of his beautiful nymphs, I suggested he re-rig his line. Following my directions, he ran a 1-inch length of hollow fly line up onto the leader and made a short necklace of crimped split shot about 8 inches above one of my weighted, bead-head patterns. When he saw me reach for the plastic tube of split shot he moaned and said how much he hated using the weights. While the addition of split shot may be the second easiest method for getting a fly to the bottom, it is often troublesome. When I need to cast 30 feet or more, I hate throwing split shot on a fly rod. They do things to the natural ballet of the line and eventually tangle and knot the leader. Not only that, split shot often comes unfastened no matter how tight I crimp it down. But, in this case, because of the narrow width of the stream, the angler did not need a long or attractive cast, he only had to lob the offering to the head of the pool. With a slow flip, he got the cast to land just above the lip of the plunge pool. Fly and weight then dropped deep into the pool before gliding downstream. The short piece of fly line on the leader acted as a strike indicator. On his second cast, the indicator darted momentary upstream. He didnÕt react, and I suspect he missed a strike. But on the next drift, he reacted properly and struck a nice trout. A few minutes later, he hit another from the same spot, fish he knew had been there all along. Of course, adding weight to the leader has its limitations when trying to get and keep a fly deep. It doesnÕt matter if you use round shot or bend a piece of flat wire from a Òmatchbook,Ó the effect is the same. When cast a decent distance, the line bends where you donÕt want it to bend, and the cast looks like someone tripping off a top step. You can ameliorate some of this by moving the shot closer to the fly, but then you run into problems with unnatural drift and other unappealing consequences. Next in the progression of ways to get a fly deep and keep it deep is to use a full-sink line. Most fly anglers use a full-floating line, but in the right situation, a full-sink line, one that sinks quickly along its entire length, can get a fly deep and keep it running along bottom for a distance. When working big rivers for big fish, a full-sink line is an excellent choice. Soon after the fly hits the water, the weighted line pulls it down and keeps it down even through the downstream arc. Full-sink lines come in various weights or densities. Depending on the density, the line sinks from 1.5 inches a second to 6.5. Frankly, I havenÕt run across a situation where a very light sinking line was of much value ( because IÕve said that, I probably will this season). But when going after big steelhead and salmon in brawling water, a Type IV line with a sink rate of 6.5 can be invaluable. It often means the difference between the fly skimming over the heads of the fish or getting down to their feeding level. However, full-sink lines have their problems, as well. First, theyÕre a pain to cast. In order to get the line out for a back cast and forward cast, you need to return practically the entire length to its starting position below the reel or in a casting tray. This makes every cast an exercise in pulling in all of the line and then forward and backcasting all of the line, which gets tiresome in a hurry. There is another problem with a full-sink line, and that is its propensity to wrap around rocks, either on the drift or when fighting a fish. The stronger the current and the larger the rocks, the more pronounced this problem becomes. A few seasons back, I was fishing a Type IV line while wading Grand Lake Stream in northeast Maine for landlocked Atlantic salmon. The specific spot is known as Little Falls and features churning, speeding water with mammoth boulders. I put up with the sinking lineÕs obstinacy because I was catching salmon on a colorful streamer. Then I hooked a dandy, one of the largest IÕd seen during the spawning run, and it quickly ran downstream. Somewhere it made an abrupt U-turn and headed back. And as it did, the sinking line wrapped around a rock. When it came to where nothing would stretch any farther, I felt a pop, and the fish was gone. I wasnÕt happy with full-sinking line at that moment. When you use a full-sinker, make sure to shorten the leader and tippet to about 3 total feet. There is no sense having the line close to the bottom and the fly riding up on a long leader and tippet. Next on the ladder for getting a fly deep and keeping it deep is a sink-tip line. This consists of floating line that runs most of the line length and then a melded length of sinking line, made with a weighted core just like the full-sink line. Once again, various densities are available, but even more importantly, so are various lengths. Depending on the manufacturer, these range from 5 to 15 feet of sink-tip. Same as a full-sink line, a sink-tip line has its positives and its negatives. A short sink-tip usually does not wrap around rocks like a full-sinker. Yet it can get a fly down and can keep it down for a considerable distance in the drift. However, once again, to cast a sink-tip line, itÕs necessary to retrieve most of the line and then backcast, forward cast, backcast and forward cast that long length. ItÕs tiresome, yet I think the thing that annoys me the most about sink-tip line is that, just as with full-sink line, I have to bring an additional reel or at least a separate spool loaded with the alternate line, so I can have it when the situation calls for it. ItÕs not a big burden, but when I donÕt bring the reel or spool, I always need it. Some manufacturers make what they call Òsinking leader,Ó especially dense mono that doesnÕt lie on the surface. While useful in still water, a sinking leader will not keep a fly deep in moving water. You need the weighted fly or line for that. Which brings us to the last and perhaps best way to get a fly down for a considerable distance with the least fuss: a sinking add-on or sinking splice. The add-on is simply a length of weighted fly line, with pre-tied loops on both ends. When needed, the add-on can be pulled from a vest and connected between the main floating fly line and the leader. Simply loop the upper connection to the fly line and the lower connection to a short leader. Sinking add-ons are also available in various densities and in short lengths just like sink-tips. They can be purchased pre-made or you can splice your own loops. You donÕt need to pack an additional spool or reel, just the length of sinking line. 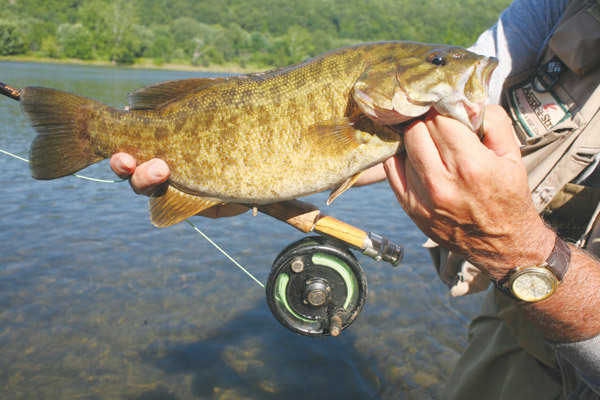 I fish the upper Delaware River for trout and the middle Delaware for smallmouth, using an add-on wherever water depth or current require it. Many times, IÕve felt that flies were skimming over the target water. Then, within a few minutes of making the loop-to-loop connections, I have drifted a fly close to bottom and caught a fish. It is so convenient, and in many instances my favorite way to get a fly deep, I consider it my secret weapon. No system for drifting a fly deep is perfect. But try these various methods, and you should find something that works in the water you face.